I think I see him over there. Yeah, at the bar, behind the drunk Hexapus in the go-go-go-go-go-go boots. I'm pretty sure that's Jeff Lemire doing shots with Neil Edwards and Jay Leisten. Ha! They must still be doing “research” for their November, 2014 work with DC Comics. Man, I hope the Hexapus doesn't eat them. To QUOTE Weird Al Yankovic: “It was smelling like a locker room. There was junk all over the floor. We're already packed in like sardines but we're stopping to pick up more”. Let's do a quick headcount, shall we? The Justice League United's roster is currently at, say, nine, assuming we include Ultra and exclude Sardath -- plus anyone currently swearing allegiance to the enemy. Then we've got four representatives from the League of Superheroes bubbling back in time. Team Byth has been supplemented by the aforementioned former hero and five members of The Cadre -- not to mention a half dozen space cultists and an endless supply of infinity wraiths. So, excluding Sardath and said cultists and wraiths, our battle royal is currently twenty characters strong. Thirteen on seven. Or twelve on seven if you consider that the Stranges can't both fight at the same time. One of them's got to ensure the Rannian fruit wine doesn't go to waste. I sure hope the good guys get some reinforcements called in. Yeah, that's what this title needs. MORE CHARACTERS. To be honest, there's more here than just a ridiculous quantity of characters joining the party. The Infinitus Saga is looking to be a good story, but this issue is mostly fighting. So let's lead off our look at the positive side of things with the return of Edwards and Leisten. As of this writing, DC's official page for this issue still lists Joseph Silver and Timothy Green II as the artists, even though the credits page in the comic lists Neil Edwards and Jay Leisten. And DC's page for issue 7 lists them as next month's art team. So it appears that they are, in fact, our ongoing art team, and Silver and Green were the anomaly. I feel like a heel for picking on Green now, but Edwards' work just fits the superhero narrative so much better. 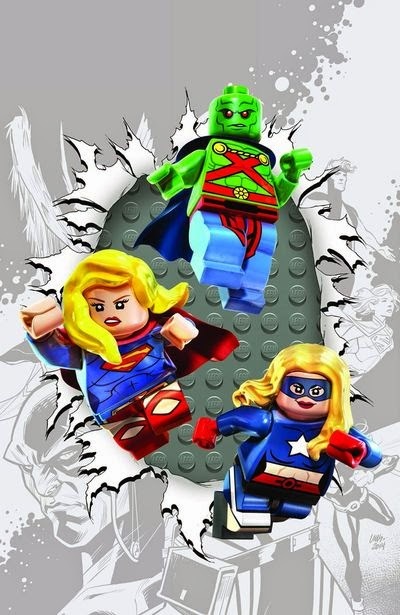 Gone is Manhunter's elongated cranium, Alanna and Miiyahbin's chests are back to a reasonable cup size, and Supergirl's eyes once again fit on her face. Edwards' style is still somewhat of a shift from McKone's -- Miiyahbin, for example, looks a bit taller and older -- bit it's still within the same range and feels like a continuation of the same characters. You know what else I love? When writers drag forgotten characters out of old stories. The New 52 has given creators the opportunity to completely reinvent characters if they wish, but even a minor reference (like all the Hitman characters in Noonan's Sleazy Bar back in Batman and Robin 28) can be a lot of fun for readers. I'll be honest; I had no idea Byth was a classic villain from the 1961 Hawkman stories in 'The Brave and The Bold'. When he first appeared in JLU I figured Lemire created him out of thin air and didn't bother to research any further. But The Cadre, whom I believe are making their New 52 debut here, just screamed Detroit era JLA. Straight out of 1985, the Overmaster comes with Shatterfist, Shrike, Black Mass, and Nightfall in tow. A martial artist, mental patient, physicist, and college student, respectively, assuming we're not going to get different New 52 origins. Absolutely ridiculous characters from an era of throwing superpowers around to as many people as possible, sure, but oh so much fun and the perfect disposable superteam to strand across the galaxy if necessary. And, if my count is right, there's twenty-one more ridiculous superthugs available to pull from to spice things up as we overcrowd this saga. While Seneca is probably the most likely choice for a stereotypical Native Canadian vs Native American showdown, I'm pulling for Mohammed Ibu Borne, because ROBOT HORSE. Lemire's writing is pretty awesome in this issue. Somehow, despite it being 95% fighting, I still feel like we learned more about our main characters, grew their relationships, and became more invested in their mission. There's no big reveal, and we already know the stakes from the Annual, but we're getting closer to that point in the prophecy and it's only the second issue of five. The tension mounts. On the lighter side, we get to find out the meaning of Miiyahbin's name. Brainiac 5 actually proves to be somewhat useful. Byth has completed his shift from generic deep space mad scientist to possibly immortal deep space religious zealot cult leader. Green Arrow and Hawkman do their best “Clark, snap out of it!” Batman vs Superman re-enactment. And Stargirl calls out a little something that caught my eye in the Annual but got lost in my rage of anti-Legionnaire ranting. Someone's powers seem to be evolving . . . But then Mon El and J'onn J'onzz bust through the side wall of an underground bunker. And we come up with more and more cover stories as to why our heroes can continue to breathe on a moon with no atmosphere despite distance from Stargirl's cosmic staff. And then Brainiac 5 calls in more reinforcements somehow, despite having no reason to know they exist, let alone their clever nickname. Incidentally, barnstorming the underground bunker was also the one misstep for Edwards and Leisten's art. It feels like they headed out to the bar and left the panel for little Billy to draw with his crayons. Other than that, there's not a whole lot to criticize in this issue unless you want me to bring up the overpopulation of Ryngor again. Well, Byth has certainly made his plans clear. As DSKOTEK's dance mix, “Destroy the Entire Universe”, is clearly taking into account, the end of the universe may not come from megalomaniacal space cult leaders but from irresponsible time-travelling weirdos. Plus it's got a nice beat and I can bug out to it. Let's see. What have we covered so far? Way too many heroes and villains throwing down? Check. An all out fight between said heroes and villains with fairly fuzzy lines of allegiance? Check. Lots of spandex, leather, lamé, and masks? Check. Sounds like a classic professional wrestling battle royal to me. Who will be the last one left in the ring? The crowd seems to be chanting for the Kryptonian. So, yeah. It's a big fight with too many characters, but it's still a good read. I'm really enjoying the Infinitus Saga. Our team is gelling. They're adapting to dealing with deep space, zeta tubing (often without warning), new members appearing (also without warning), and supervillains escalating their supervillaining (you guessed it) without warning. Now if only they could deal with these Johnny-come-latelies from the future trying to take over their team. 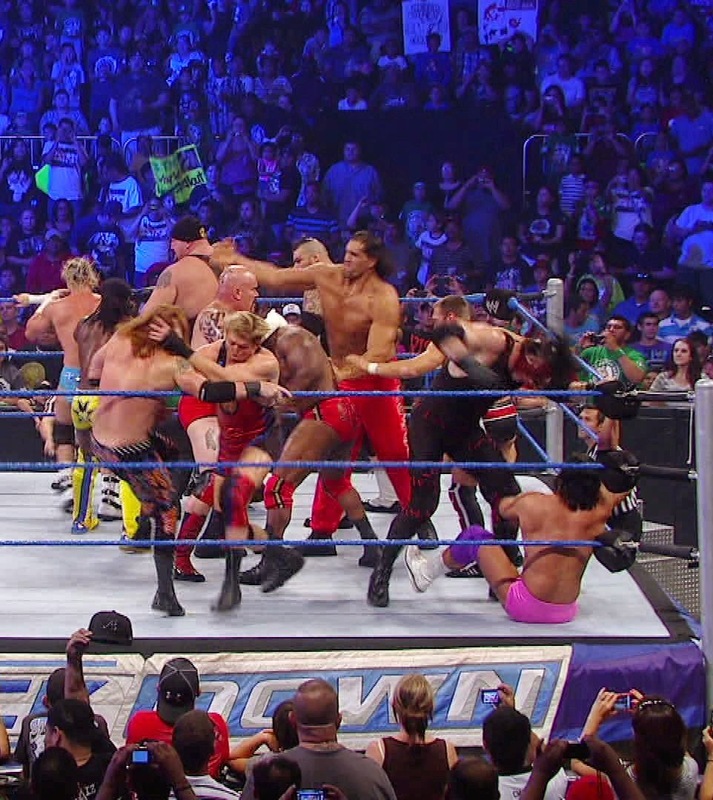 Once you get past a certain point of ridiculous head count, though, you might as well just see how far you can take it before someone calls foul. 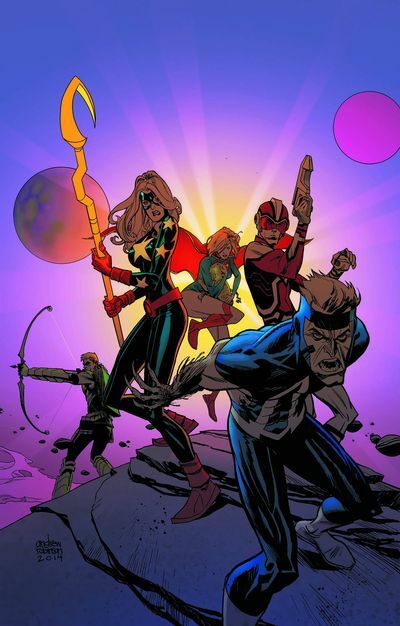 Who will Jeff Lemire add to the melee in next month's issue of Justice League United? Booster Gold. It's always Booster Gold with this type of mess, isn't it? Captain Comet and the Aberrant Six? Baron Bedlam and the Masters of Disaster? One Direction with no direction? The long awaited return of Deep Six? The not so long awaited return of syphilis? Harry Matthews and Randu Singh come to the rescue! !